A huge thanks to Target for asking me to collaborate with them to showcase the fab school supplies they have right now and for sponsoring a $200 Target gift card giveaway! Affiliate links are used in this post. I know the month of August can be stressful for parents getting their kids ready for back to school, but let’s not forget to bask in the awesomeness that is school supplies. I cannot get enough school/office supplies, and this time of year at Target is like Christmas for me. I went shopping and ended up with a ton of goodies for my DIY crafts and home office. Also, I’m giving away a $200 Target gift card (details at end of post) for YOU to get some back to school goodies. As a DIY blogger, I appreciate this time of year because I buy school supplies to amp up my DIY arsenal with paint markers, twistable colored pencils, magnet letters/paper, printer paper, paper cutters, and colored pens galore for my planner. I saved money on my purchases using Target’s Cartwheel app which has back to school deals now through September, plus you can get a free $5 Target gift card when you buy $30 worth of school supplies or $10 when you spend $50. 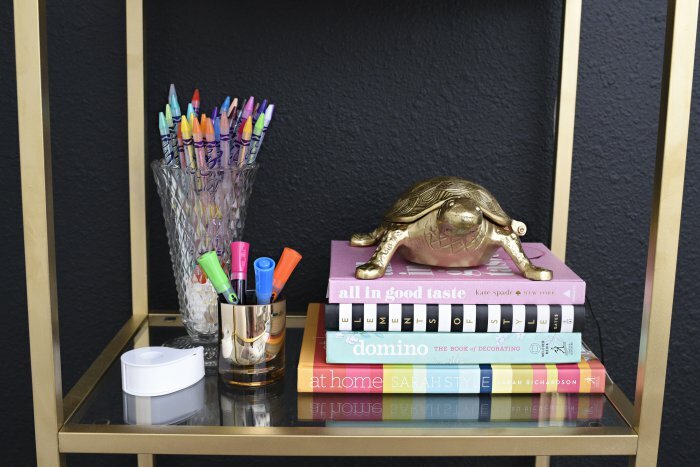 The home decor lover in me loves incorporating beautiful and functional school supplies in my home office to be more organized. I’ve had this empty wall in my office, and I’ve been wanting a gallery wall for awhile, but I also wanted a marker board and cork boards to organize my projects and ideas. 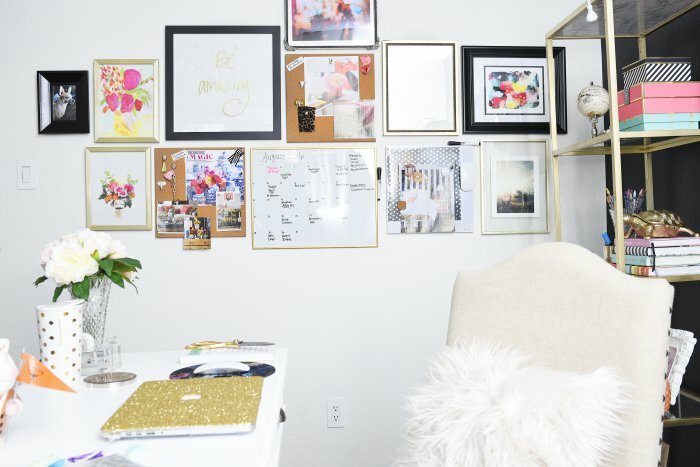 The majority of the the items on the wall are from Target for this project, including two square cork boards, a marker board calendar, and a square marker board. Cute gold and white animal push pins, hook push pins, Bethany Mota tassels, magnetic locker paper, magnetic eraser, magnetic letters, and bright dry erase markers also came home with me. All of those accessories, paired with artwork I already had (including the gorgeous Oh Joy! Winkie print and floral print), finally brought my vision to life. 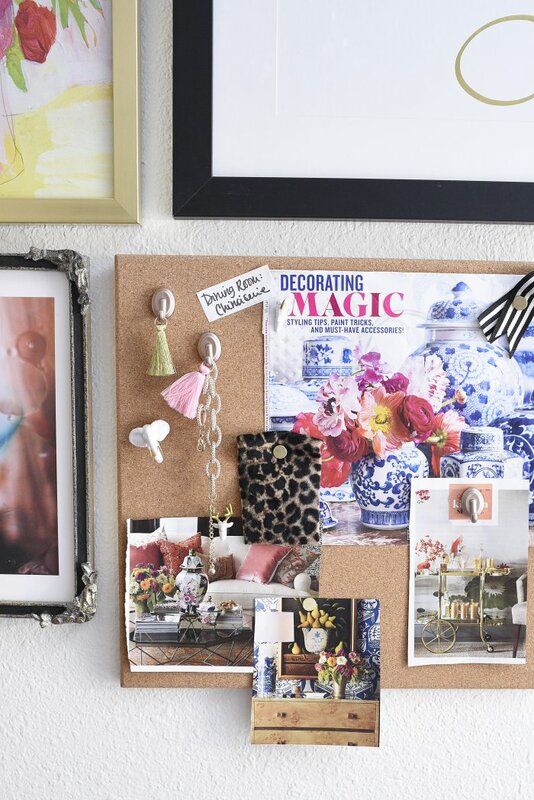 One cork board has my plans for the dining room makeover, and the other has ideas for the living room. The animal push pins, particular the unicorn one, make me so darn happy. It’s the little things. 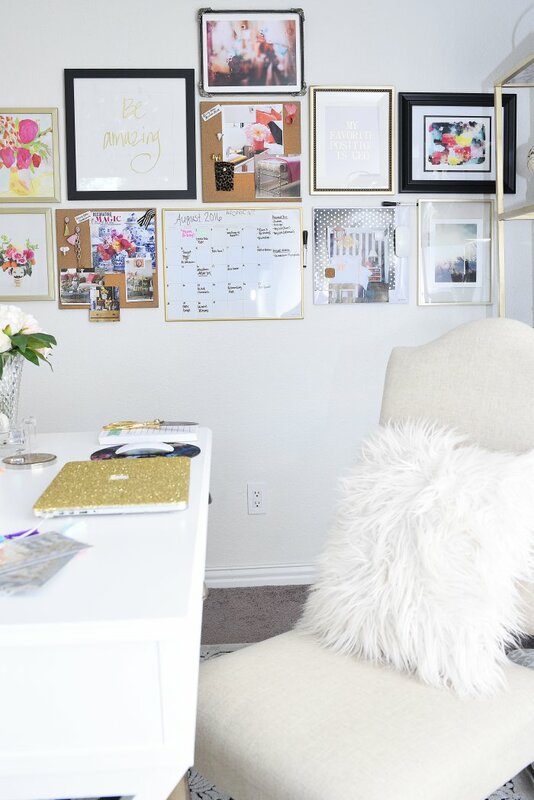 The whole gallery wall makes the office cheery, and the products from Target are truly what make this a functional gallery wall that is easy to change/adapt. The calendar helps me organize my editorial calendar for my blog, and I HOPE I’ll be more productive using this system. On the shelf nearest the gallery wall, I put my new dry erase markers, label paper roll, colored pencils, and my washi tape (which rest inside a turtle, also found at Target earlier this summer). Target carries one of my most favorite lines of office/school supplies, Sugar Paper, which I’ve written about before. The Sugar Paper line has a distinct feminine feel, high end look, and is affordable. I snagged up these items from their newest addition to the Sugar Paper line-up: magazine rack, fastener set, and file folders. The magazine rack fits in beautifully with my other office accessories. It easily holds several magazines, plus some file folders that will hopefully encourage me to finally develop an effective filing system. The cloth is a leather-like material and the overall construction is high quality. The fastener set comes with a small holder that makes it portable. You can see me checking out the Cartwheel app below to see what other deals are available. I love saving money! 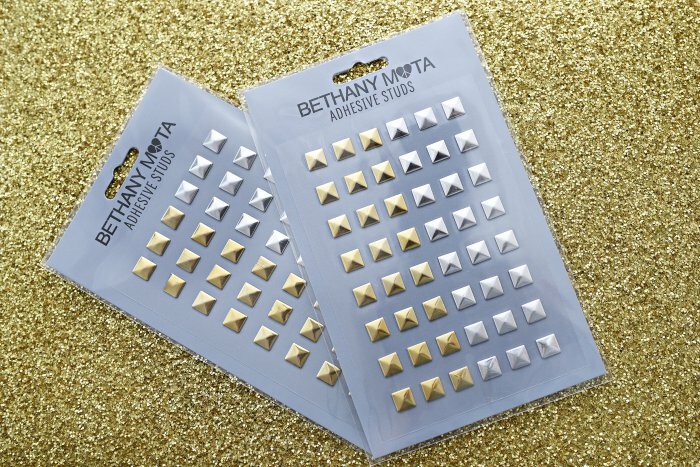 I also discovered the Bethany Mota collection– Bethany is a popular YouTuber with a fun school supply collection perfect for any DIY/crafts lover. 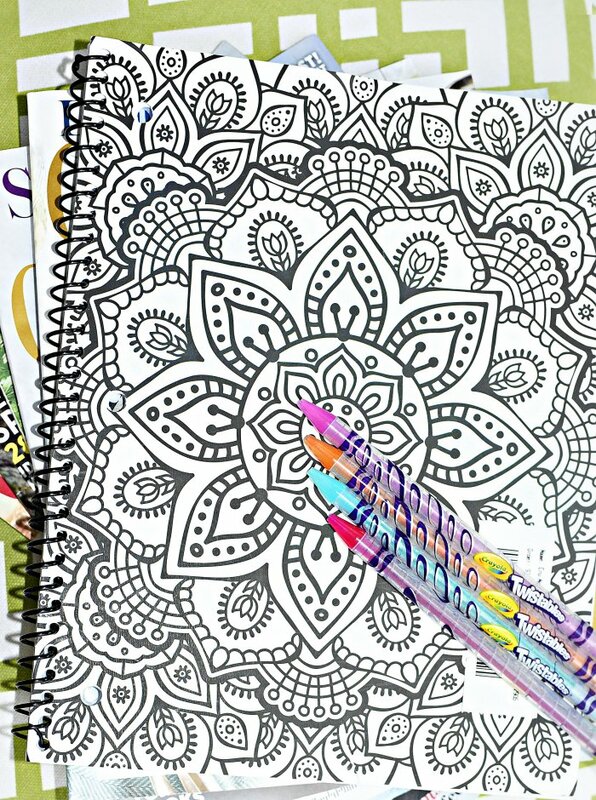 I love the cover of her spiral notebooks and journals, which feature a gorgeous design you can color yourself. I used this notebook as an excuse to buy new metallic markers, colored pencils and markers. I’ll fill it in while watching TV this week as a way to relax and destress. There’s also clipboards and binders you can decorate and adorn with cute studs, tassels, stamps/ink pads and stickers from her collection. I bought the tassels to help with my color inspiration for my cork boards (and to color mark my vast collection of keys! ), and the adhesive studs below I’ll likely use to give some plain candles an edgy look for my fall decor. You could also use these to add a border to a frame or cork board for a custom look. My Target experience was fun, like always, but I have to commend them for how well organized their back to school section is. There’s color coded end caps/section that make it a breeze to find what you’re looking for. In addition to all the cute stuff seen here, I also snagged a new paper cutter, copy paper, photo paper, laminating sheets, and double-sided tape for my crafting/gift wrapping. My office definitely feels a bit more cheery, organized and glam with the addition of these school supplies. If being addicted to office supplies is wrong, I don’t want to be right. I’m sharing the love and giving away a $200 Target gift card to a lucky reader. Enter using the rafflecopter widget below- good luck! Giveaway is open until August 14 at 10 pm CST. I like the lunch satchels and colorful backpacks. The Bethany Mota spiral notebooks are my favorite. the calendars are so cute! Love their notebooks! and the children get their school clothes at Target as well! The magazine rack is so pretty! Love the file holder too! I love shopping for back to school items at Target! My favorite back to school item at Target has to be their awesome backpacks! I like the sugar paper magazine rack. I really like the magnetic frame marker board. I like Targets selection of bookbags and lunchbags. My granddaughter picked a lunch bag that looks like a hamburger. So cute. Every one needs a good planner for the year! I loved the sugar paper magazine racks. Wow this office is stunning!!! I always love getting items for gallery walls at target too! And their notebooks for back to school get me every time! 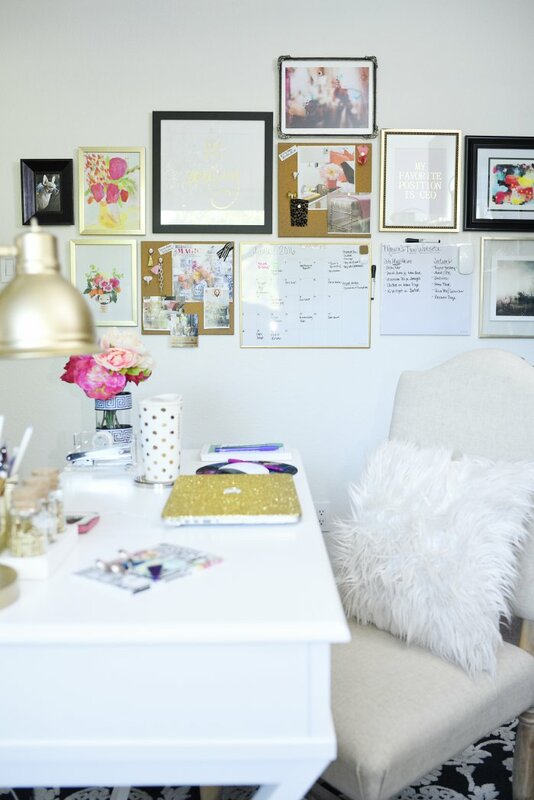 Oh I love your gallery wall! I have wanted to get a marker board and cork board too! Those would be so helpful in staying organized this school year!!! Their Ubrands Dry Erase Calendar, Aluminum Frame, 16" x 20" – Silver/Gold is my favorite back to school product! This would be great to have to keep track of assignments due and activities going on. I like the marker board calendar, it is something I really need and could use. I love the color-coordinated items Target carries – it's fun to put together an overall orange theme in my office. I like the Green Inspired Wire O Notebook Inspired Landscape. I absolutely love the little mini Sharpie pens they have this year and the green folders with the glitter gold dots. They knock it out of the park every year really. I love the Sugar Paper magazine rack. WE get pens and paper primarily at Target. Our kids also pack their lunch, so they love picking out their lunchboxes. The gold and white animal push pins are the cutest. Jenn G.
Beautiful! I am a sucker for the cute design folders! I'm a teacher so I love the markets, colored pencils, marker board and washi tape! Thanks for your ideas! Just found your blog and love it! I'm a teacher so I would love the paint markers, colored pencils, washi tape, and cork boards! Thanks for the ideas!! I love the Target brand notebooks and highlighters. I love those Crayola Twistable Colored Pencils. I love the magazine rack! I love the animal pushpins and the sugar paper file folder set! my daughter love their dresses she will wear from back to school and also supercute notebooks with matching folders. I really like their notebooks and marker board calendar! I just love there notebooks and there glitter glue. I like the Bethany Mota spiral notebooks. Love those animal pushpins from Target! Love those animal push pins. Your decorations are always beautiful. Love it all! Those adhesive studs are crazy awesome, so many options! Love the decorative push pins! I love all their cute binders and notebooks! I like the sturdy binders that they offer. Always need binders for classes. I love the notebooks and blank journals with all the pretty colors! I truly enjoyed reading your decorating tips, and what I love are the Bethany Mota n Notebooks. I love all of the gold accents. I also love the cute push pins. I like the Sugar Paper magazine racks. I like the Bethany Mota spiral notebooks. I usually buy all my school supplies at Target. I love your decorating style! 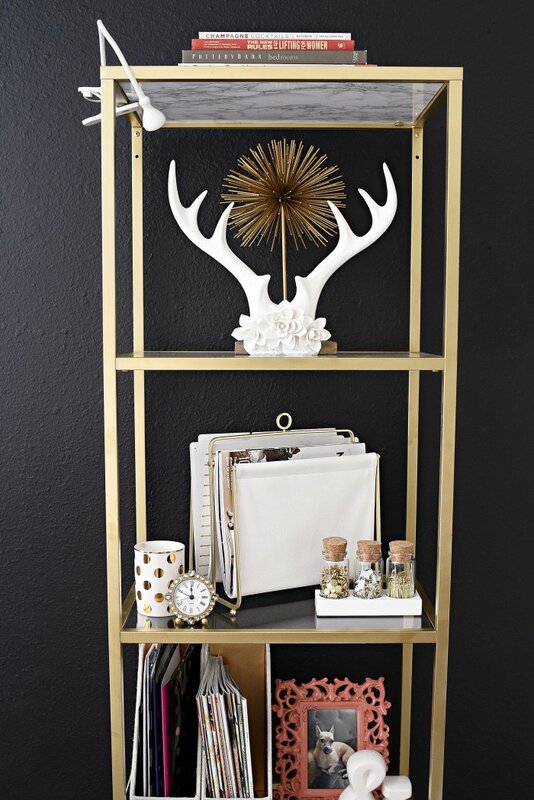 My favorite is the Sugar Paper Magazine Rack – Cloth with Gold Rack! I love the notebooks and pushpins! I'm loving those animal pushpins! my nieces would enjoy those. the turtle is so adorablelinda! I like and need the Marker Board Calendar to keep everything straight this school year! 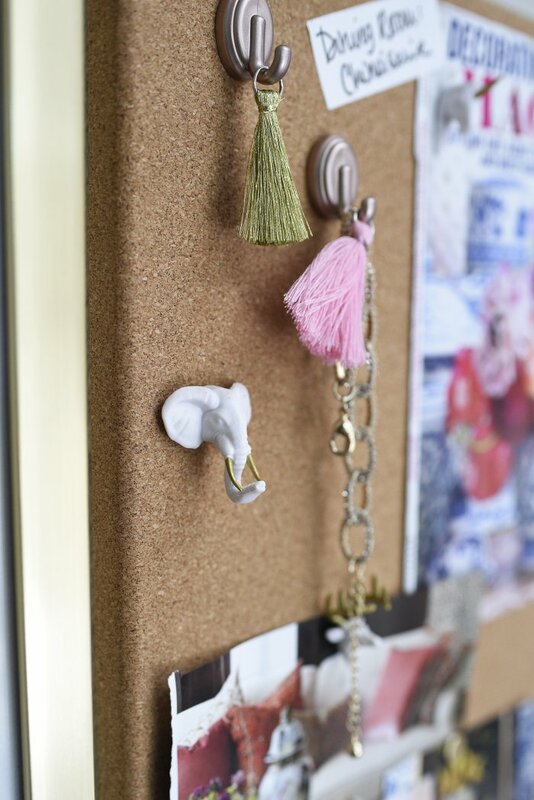 I love the cork boards – these are attractive and conducive to pinning things you need to keep in mind, and putting things you like to see! 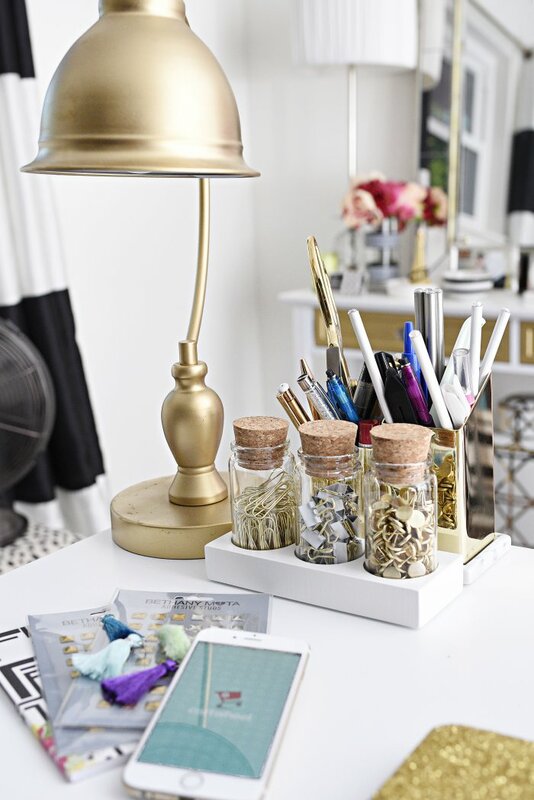 I like their different shelving and desk organizational tools. My favorite is the marker board calendar. My favorite school supply item at Target is the Bethany Mota collection. Her spiral notebooks and journals are really cool, plus, you can color the covers! I LOVE THE SELECTION OF KIDS BACKPACKS AT TARGET. MY SON WANTS THE Nickelodeon Teenage Mutant Ninja Turtles Backpack 🙂 I also love that if you spend $30 on school supplies you get a $5 gift card ! 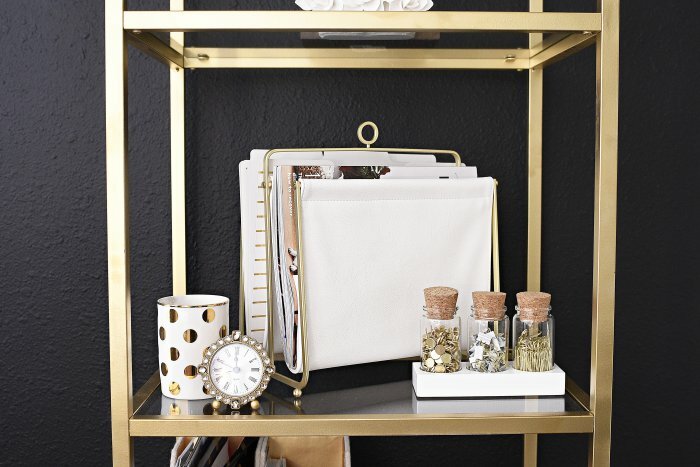 I love Target's Nate Berkus office supply line! Completely unnecessary to own a metallic gold stapler, but I WANT so much! It's Ro—it wouldn't let me sign into my other Google acct! Lol Forget the kids…I'm going supply shopping for me! I love love your turtle! Everything you do inspires me! Everything you do inspires me!!! I am OBSESSED with sticky notes! I love the traditional pale yellow, the lined, the small squares in bold colors, the to do list variety… I've even found some that that are lined with tabs on the side so you can take notes in books. I have the Cartwheel app as well.. they've helped me save so much money on all those Threshold seagrass baskets I've been buying to keep my office/bathroom/living room organized! Your office is beautiful. I love the gold accessories! I love your office! It's gorgeous! My favorite supplies from target….notebooks! They have the best designs. We like the Crayola Markers that are on sale for .99 right now. And we like the glitter glue and stickers. Have I told you lately how much I adore your sense of design? Because I do. Your office is fabulous! I want my classroom to look like this! 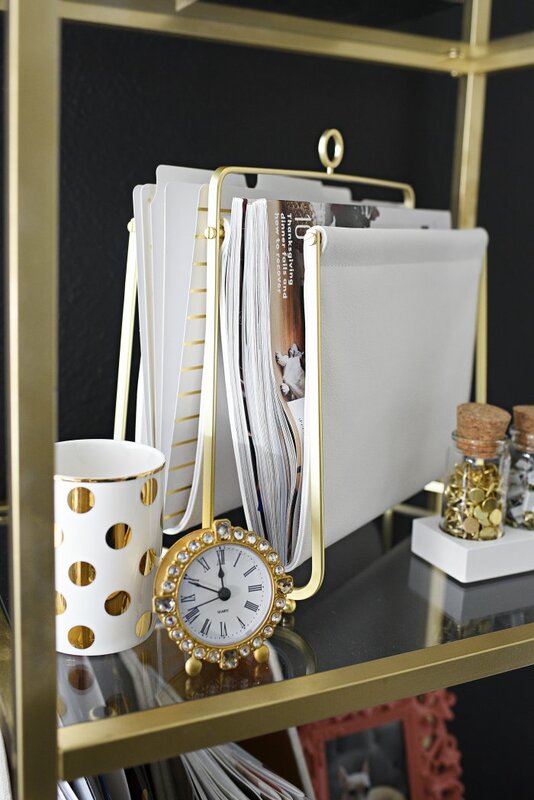 Love the new additions to your office, that magazine rack is something I need. I love your office. Its so cute & inspiring. You can never go wrong with Target! I love how you combined your artwork with the cork squares and the other boards. Lovely idea! I always admire your decoration skills. I am a big fan of yours. I wish I can win the gift cards because here in Greece we have not such beautiful office supplies. I do not care to pay shipping expenses. Have a wonderful week and thank you for the opportunity. Those animal pushpins are too cute!! I have serious home decor envy everytime I see your pics! I love the cute notebooks that they offer! Love this Monica! 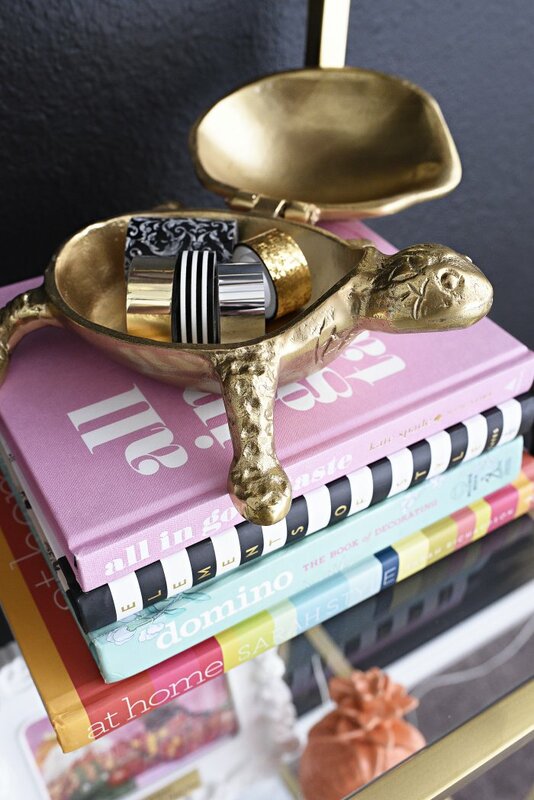 I've been eyeing that file holder for a coupe of weeks now. I think I'm going to pick one up now!! I always enjoy your decorating tips! I have a small spare bedroom I'll be using as a study. I'll definitely use your blogs as inspiration! Your office looks so good! 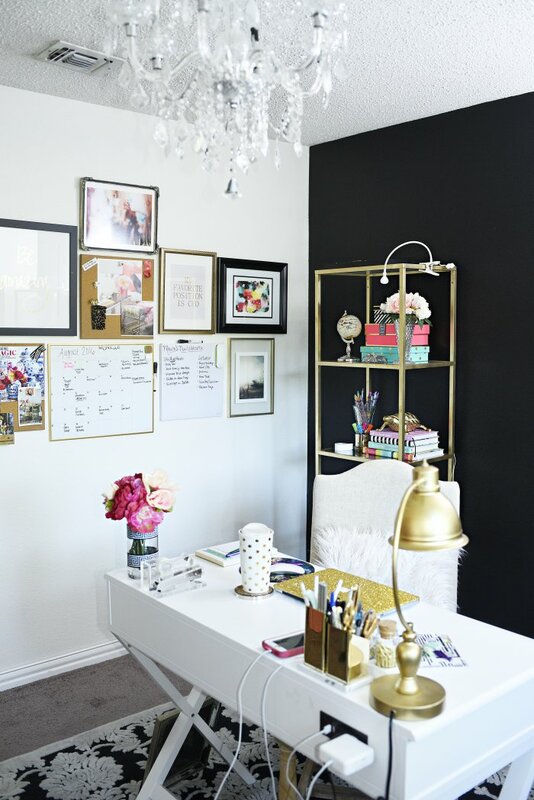 I have serious office envy and really need to kick my family out of the shared office/den so I can make a girly glam space like yours! Target is my weak spot and the Sugar Paper collection is my favorite–I have the striped planner and will add some more supplies when I go to Target this week. Danger Zone!